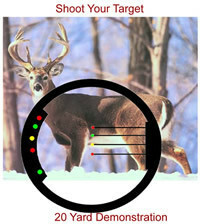 Dead-On Range Finder is the simplest and most effective Range Finding System for bow hunters...Guaranteed! We ship anywhere within the USA! Due to recent changes in international shipping policy, we will no longer be shipping internationally. Our sincere apologies for the inconvenience. Instantly range animals hands free while at full draw, with no game spooking movement. 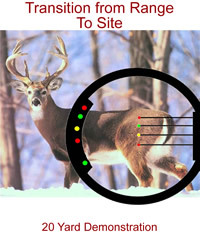 Dead-On Range Finding System produces results accurately and efficiently, every time. Range animals on the move or in thick cover. Simply bracket the animal while at full draw then use your pin to make the shot! The Dead-On Range Finder is Universal and Installs on ANY BOW SIGHT in a matter of minutes. Every system kit comes with complete details. Installation of our state-of-the art Range Finding System is simple, straight-forward and can be accomplished by any Archery Hunter. Step 1: At full draw, align the bottom pin with the belly line of the animal and measure the back. You’ll immediately know the distance. Works from any shooting range! * If the back of the animal is halfway between pins, the animal is 25, 35, 45, or 55 yards away. Step 2: Transition from Ranging the animal to your sight pins. Step 3: Using your current pin setup, make the shot. Range whitetail and antelope to 50 yards, and mule deer, elk, and turkey to 60 yards. The Dead-On Range Finder is Univeral and Installs on ANY BOW SIGHT in a matter of minutes. Every kit comes with complete details. 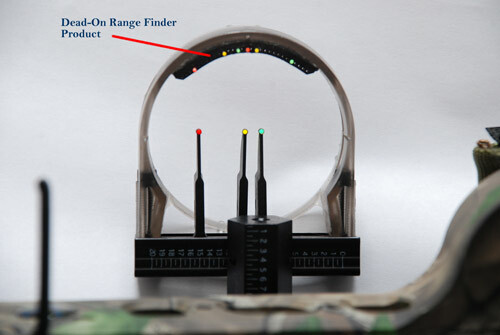 Complete installation of our state-of-the art range finder is simple, straight-forward and can be accomplished by any Archery Hunter. Clean the side of the bow sight pin guard. Peel the protective back off of the Dead-On Range Finder to expose the adhesive surface. Apply the Dead-On Range Finder to the bow sight pin guard where it will give you the best view of your target game animal and press firmly. You do not need to ‘line up’ with any of your sight pins. Place the fiber optic pins in their positions starting from the bottom according to the appropriate calibration chart in the package insert. 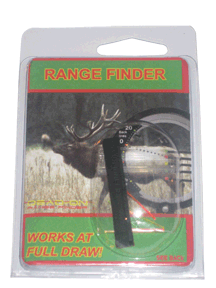 This will calibrate the Dead-On Range Finder for your draw lenght and specific game animal. That’s it! Your Dead-On Range Finder is now ready for your next Big Game Hunt! Of course, we highly recommend that you practice with the range finder at various ranges* to familiarize yourself with the Dead-On Range Finder. You will find that integrating the “ranging” process into your shot steps is effortless, quick and can be performed at a full-draw. Match the color of your Dead-on Range Finder yardage pins to the color of your sight pins. Then simply range a color, and then use that color of sight pin. No need to count your pins. Set our range finder up for two different animal species by using two different color fiber optic pins. 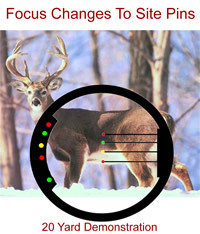 Example: green for Elk setting and red for Whitetail setting. Practice quickly ranging your target and transferring to your shooting pins in a smooth, low-motion effort, relying on the high-visibility fiber optics of the Dead-On Range Finder.